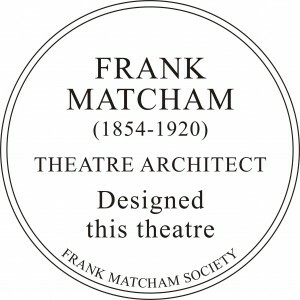 The remaining Frank Matcham designed or adapted theatres are listed here. Follow the venue name link to go to their website. At the end of each entry is a link to the Theatres Trust Database page for that theatre, where you will find more detailed information about each venue. Much more information about all theatres in the UK can be found on the splendid Arthur Lloyd Music Hall and Theatre Site resource. *See also Matcham theatres with online virtual tours for you to enjoy, either bespoke or courtesy of Google Street View and YouTube – links below.